We'll be spreading the connections from Twitter to include: Facebook and Instagram! 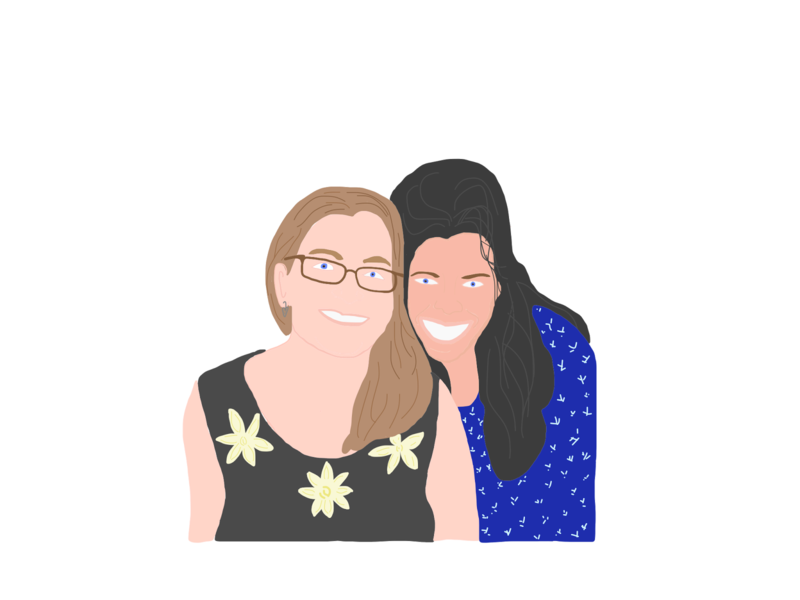 Enter the new look on this blog! We've also given our Facebook page and our Twitter page an updated look as well! Be on the look out for some new ways to connect using a Facebook Group as well as Instagram! We're hard at work on creating a spreadsheet for sign ups to make connections and share tasks on social media for the 2019-20 school year! We've got some webinars and podcast shows lined up to share the goodness! If you've ever connected with us before, we'd love to have you join us for the new year! We're looking forward to connecting with you soon! PS...we're still connecting with Twitter shares through the end of this year! Just look for the hashtag #gmttc...see you there! It's a NEW year for making Connections! Welcome to 2018-2019 Global Math Task Twitter Challenge! classrooms and students to share the learning! connect your students to share the learning! Happy summer! 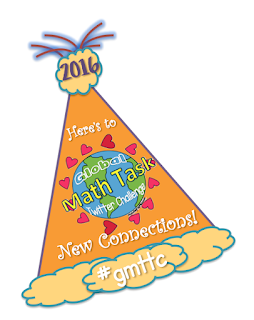 Thanks to all of you Global Math Task is beginning its 4th year of connecting over 3,000 classes around the global to share the learning with math tasks! We have some exciting updates for the Global Math Task Twitter Challenge this year that we wanted to share with you. We are no longer requiring classes to sign up to tweet task. We want you to tweet tasks when it it feasible for you. We have set up a spreadsheet for you to sign up by grade level (1st-8th grade) to build connections and collaborate with others across the globe. 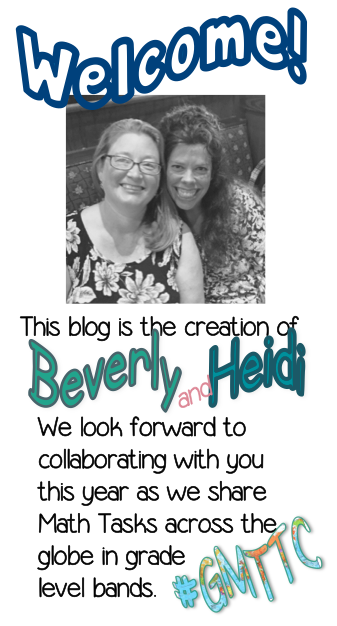 When Heidi and I (Beverly) first started on this journey, we collaborated on skills our students were studying and struggling with at the time. Our classes alternated tweeting so we knew which days/weeks what class was doing what. This made it easier to know what to expect and helped us plan tasks and solutions. The students always looked forward to tweeting or getting that reply to their math task by tweet. It was through our class collaborations that our students formed a connection with each other. Sharing math tasks became a meaningful way to share strategies for our students. We want the same collaboration opportunities for you and your students. By signing up in the spreadsheet we hope you are able to make connections, collaborate and see your students grow in the ability to complete math tasks. We have seen our own students grow in their practice of ‘critiquing the reasoning of others’ as we participated in the different challenges throughout the years. Lastly, just because we are edtech junkies (and believe in student engagement), we are on Flipgrid! We love putting their learning in the hands of students. We would love to hear your students voice how they found the solutions as well. There are many ways your class can connect to share the learning this year. Remember mystery number skypes, padlets and Twitter polls are all ways to connect as well. We will be posting ways to connect on twitter throughout the year as well. Look for the #gmttc24 numbers to be tweeted each week! We hope you’ll share back solutions with us. 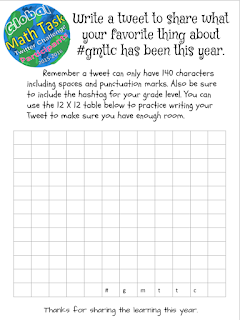 When you post something make sure to tag @globalmathtask and #gmttc so we can see it and share it. 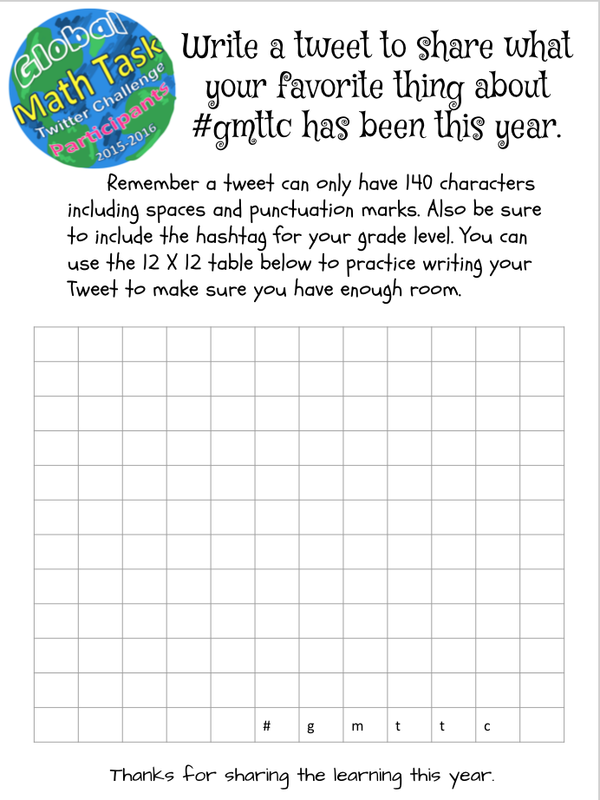 Don’t forget to add the grade level to your #gmttc hashtag so that teachers can find your task as they search using the Twitter search bar. Be sure to hop over to the blog and check out resources and ideas shared there as well! Thanks to all of you for making @globalmathtask so special for students around the world! It’s going to be another amazing year. Let Heidi or I (Beverly) know if you need anything! We are always open to ideas and feedback. If you have any questions or need help in any way, please contact Beverly Ladd (@BevLadd) or Heidi Samuelson (@swampfrogfirst). We’ll be happy to help you as much as we can. Global Math Task Twitter Challenge Participant. Click HERE for access to the google drive folder with the different badge options. by uploading the new image in your settings. After you download the Header Image you want...click on edit profile. Then upload the new photo to your "change your header photo" section. Click apply and save changes. You can also add a badge to your Twitter profile picture. Just download the badge you want to add to you picture. 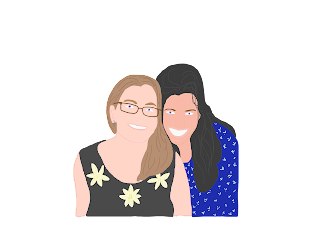 Add it to your profile picture in google draw or power point. Save your new picture as a jpeg. And edit your profile to add your new picture. The new spreadsheet is available HERE. Do you enjoy connecting your students to share in the learning? Then have we got a challenge for you! 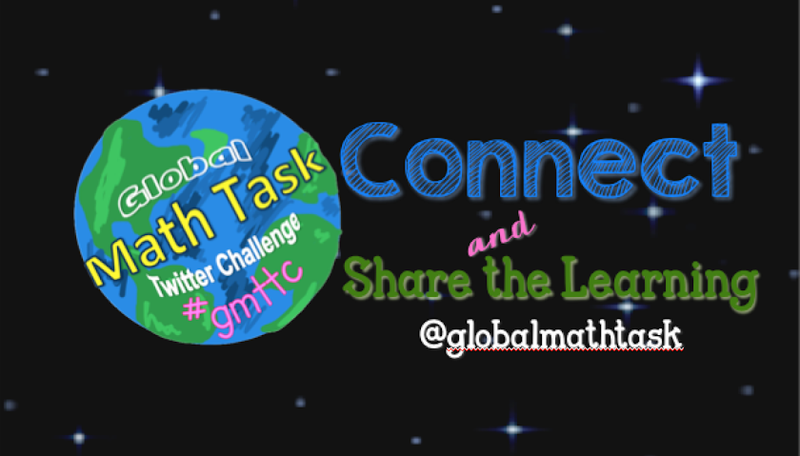 The Global Math Task Twitter Challenge (@globalmathtask) is entering it's second full year of sharing! We'd love to have you join in the fun and connect with us! 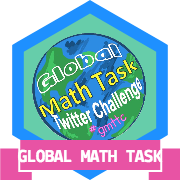 We are looking for students/homeschoolers/classes/teachers of all ages, all over the world, to participate in this year’s Global Math Task Twitter Challenge starting in the fall of 2016. If you follow Beverly Ladd (@bevery_ladd) or Heidi Samuelson (@swampfrogkids) on Twitter, you might have seen us tweeting math problems and tasks for other classes to answer. We want to expand on our experiences and share them with you! We think we've created a fantastic way for teachers all over the globe to connect and do the same through @globalmathtask. You can join in the challenge at any time! Just follow the hashtag for your grade(age) level and respond to tasks being shared out. For instance if you want to look at the tasks being shared by fourth graders, search the hashtag #gmttc4. Find a task you’d like your students to solve. Then share out your solution using the same hashtag so that others can comment and connect to share their thoughts as well. We Need/ LOVE to have classes/teachers sign up for a week to tweet tasks during the 2016-17 school year. It’s easy to do and we promise to help as much as we can to make your tweets and challenges as successful as they can be! Just sign up for a week (or two or three) to dedicate your time/students/classes to sharing tasks of the math skills you're working on during that week. You can share tasks as a picture, words, GIFs, videos, (either generated by you or your students) or knock our socks off and come up with something unique to share the task! What you’ll need: a personal or class Twitter Account and a device to share your tweets with the world. Make sure to follow the appropriate hashtag for your grade(age) level because questions could be posted at anytime from anywhere around the world. Also be sure to follow @globlamathtask on Twitter for updates and shares throughout the year. When you tweet a math task, be sure to include the hashtag. 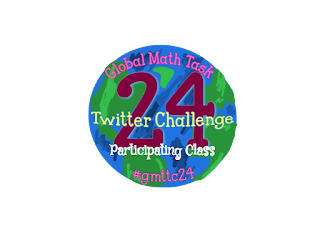 If you tag @globalmathtask in your tweet, we can retweet your task to help you share your learning with other classes. We understand that some countries have different conversions and systems when it comes to money and measurement. If you chose to tweet measurement problems, please be aware that not all countries will be able to participate or it can be taken as an additional challenge to teach your students to convert them. We’ll start the challenge at the beginning of September 2016 and go until the beginning of May 2017. Be brave! Sign up for a week or two now. We’ll send a reminder email (and text) before your week to give you time to prepare for your tweeting of the tasks! your very own math tasks with other classes! We’re also starting a NEW challenge this year: #gmttc24! …four numbers will be tweeted out at the beginning of the week with the hashtag #gmttc24. The challenge will be to come up with as many ways as you possibly can to use all of the numbers to create the number 24. You can add, multiply, subtract, and divide. as many different number combinations to create the number 24. One class would be in charge of keeping track of the different solutions to see which week has the most different combinations. This will be great practice for students around the world to share their thinking as they share the different solution combinations! Lastly, if you would like to receive RemindHQ notifications about the Global Math Task Twitter Challenge please follow these steps. To receive messages via text, text @gmathc to 81010. 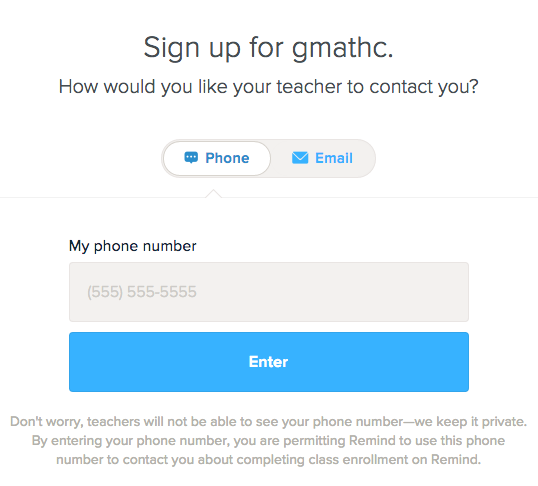 You can opt-out of messages at anytime by replying, 'unsubscribe @gmathc'. Trouble using 81010? Try texting @gmathc to (917) 746-0412 instead. Or to receive messages via email, send an email to gmathc@mail.remind.com. To unsubscribe, reply with 'unsubscribe' in the subject line. Please contact Beverly, @bevladd ,or Heidi, @swampfrogfirst, if you have any questions. that have participated and shared the learning this year! 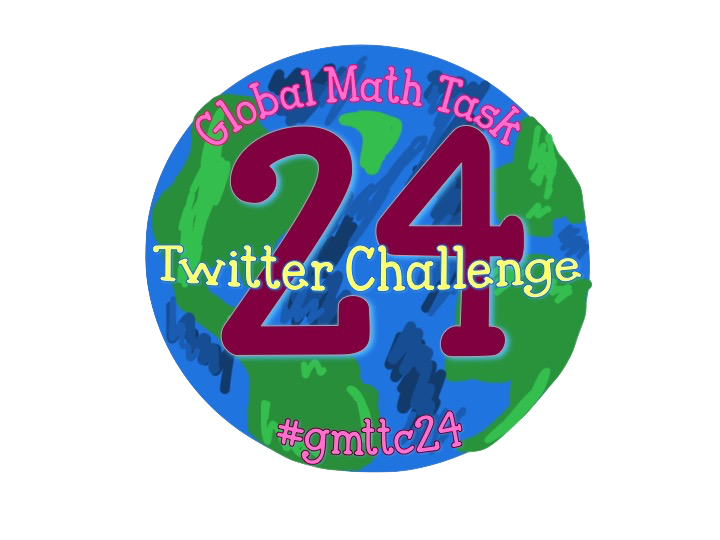 Global Math Task Twitter Challenge this year. to connect our students to share the learning with math tasks again! How are you connecting your students to share the learning? Are you a #gmttc participant? beyond the walls of your classroom! Click on this one and add in your answer to the task in the black at the top of the chalkboard style background. We'd love more interaction on how you might solve this task! Are you videoing and sharing on youtube? Do you create images with your Students to send out tasks? Are you using google slides? Please share how you connect! We'd love to learn more ways!